As usual we will start with the HTML changes, because they are easier to understand. The new link is at line 13. The new link is at line 14. Moving on to the template page. This is a simple page with a list to show all the templates and a button to create a new template. And now the last page. Here we will create the template, save it, modify it, use it and delete it. And that’s all for the HTML. Because we are creating templates to send in the future we must store them somewhere. However we will not use the Tizen’s file system API to store the template. I will use a HTML5 Storage specification, basically it’s a persistent Hashmap. But if you want to read more about it, check here: http://www.w3.org/TR/webstorage/ And the reason that I’m not using the file system API it is because the HTML5 specification is much more suitable for our requirements. To store values in the phone’s hard drive we will use localStorage.setItem(key, value), where key is going to be the template title and value the template’s content. The variable peopleToSend is an array that will store the contacts that we would like to send the SMS to, the indexPeopleToSend is the index of this array and templateToSendOrCreate is a flag that says if we are creating or sending a template. 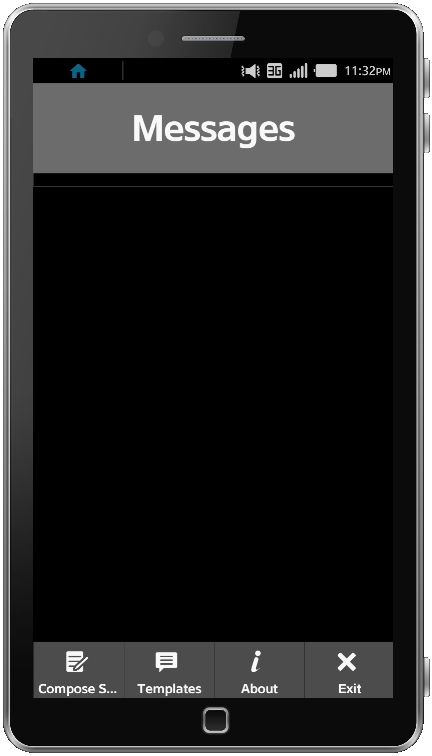 We first check if localStorage is available and of course it is, because Tizen has a recent WebKit implementation. However it’s a good practice to check if resources are available, then after this we call the function loadTemplates() to load the templates. Loading the templates is basically iterating over our localStorage variable and putting the key (the template title) in the list. But first we check from where we came from to know what function should I call if the user click on the item. 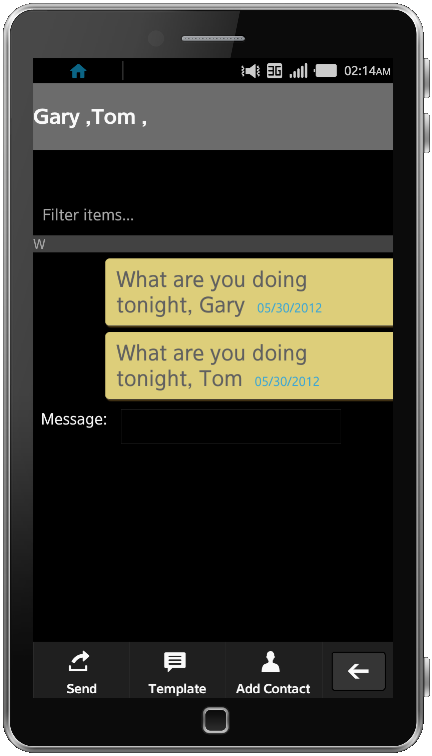 If the user came from the compose SMS screen we will call setTemplateForMessage otherwise editTemplate. Before I save the template I make the check to see if the user is editing a template title. So I check the id with the possible new title if they are different it means the user changed the template’s title. Otherwise is a new template or the user is just editing the template’s content, so just save it. Just retrieve the value from the tempalteIdUpdate variable and remove it. 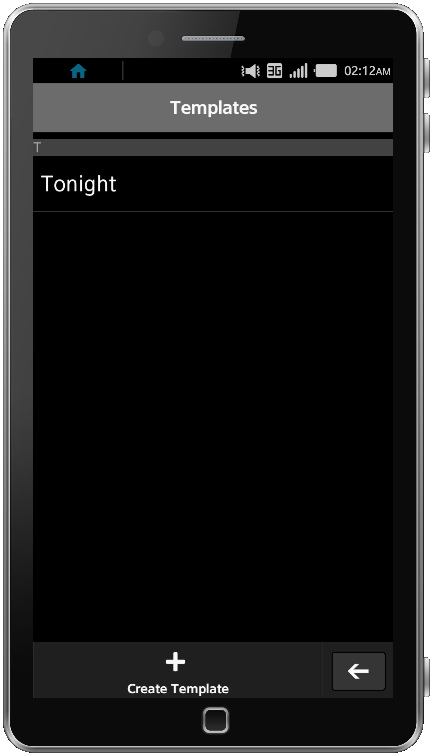 Now I have two functions that their job are just put the template content in the screen to send the SMS or edit the template itself. This function is called when the user wants to use the template in the SMS, so we just get its value and put in the message text box. And the last function is called when the user is going to edit a template. That’s all for template management. 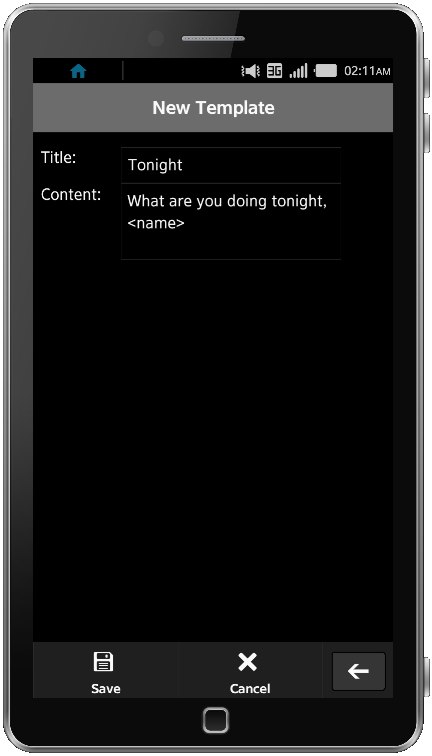 Remenber that I said that the App would replace “<name>” with the contact name and send the SMS? What we modified here is the peopleToSend array, we are pushing the contactId and their names to be used in the sendSMS function. Doing this we are able to send SMS to as many contacts as we want ! This part is interesting, because I had some problems when I tried to call smsService.sendMessage() over and over again inside a “for” loop. It seems it’s not safe to call this function until the callback was called. See? I update the indexPeopleToSend and call the sendSMS again.